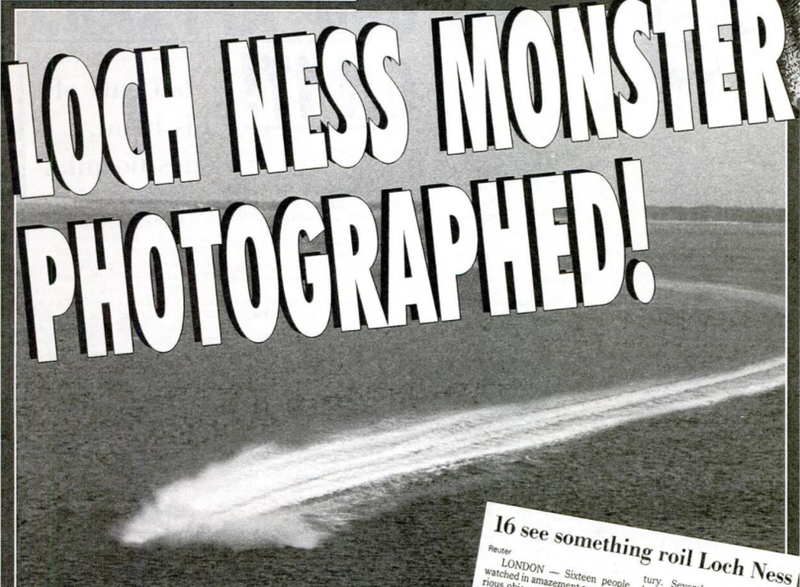 This is just one of the over 1000 sightings of the Loch Ness Monster recorded in the Official Loch Ness Monster Sightings Register. The register records encounters with the Monster that go back almost 1500 years to 565AD. On the 22nd of August in that year the Irish Saint Columba encountered a creature, not in the loch itself, but in the River Ness that flows out of the loch to connect with the North Sea. Although known for a host of other deeds that included bringing Christianity to the Picts, St. Columba not only saw the monster, but spoke to it. In a story told over 100 years after the event, the saint saved one of his followers from being attacked by the creature. He made the sign of the cross and commanded it to "Go no further. Do not touch the man. Go back at once." This is the only sighting recorded until 1520 and through the next 300 years descriptions of Nessie are sporadic. But in the early 1930s a road opened around Loch Ness and sightings poured in. In 1933 the Inverness Courier told the story of Mr. & Mrs MacKay’s encounter with what they called the Loch Ness Monster for the first time. Since then there have been sightings, films, and sonar recordings of unexplained phenomena that have become part of the Loch Ness Monster myth. Many of these describe a long-necked creature that resembles the plesiosaurs of prehistoric times. The encounters are usually distant sightings on the waters of the loch but among those 1000 sightings are some that are more unusual than others. There is the 1959 story of Beppo the Clown who saw the glowing eyes of Nessie underwater whilst engaged in a publicity stunt for his circus. Or one of the encounters of Nessie on land—like that of Arthur Grant in 1934. He described how he almost hit the monster with his motorcycle while Nessie was crossing the road. There’s even one swimmer in the 70s who claimed the creature touched him, although this seems to be the only example of physical contact on record. While many people claim to have seen the Loch Ness Monster, almost as many claim to have explanations for the sightings. The people explain away the sightings as logs in the water, seals or otters at play in the loch, wind-blown waves or boats. There are also theories the monster has a supernatural or extra-terrestrial origin. The story of the monster has also attracted high profile hoaxes over the years. These hoaxes have done little to stop the army of monster hunters trying to find undeniable proof of the monster’s existence. The Loch Ness Monster is often described as a long-necked plesiosaur. To explain how this could be the case, theorists suggest several plesiosaurs may have become frozen, thawed out millennia later and continued to breed. The counter argument says for plesiosaurs to survive in the lake a breeding population would be required and this would make them much more visible, particularly given they were air breathing reptiles. Fish stocks in the loch also seem to be too low to support even a modest number of such a large dinosaur. Sturgeons are fascinating creatures in their own right. Having existed for hundreds of thousands of years as a species they are a genuine prehistoric contender to the title of Loch Ness Monster. These ancient fish travel great distances, even reaching the mouth of the River Ness. A spookier and more supernatural explanation for the Monster occurs in the ancient Celtic Legends of the Water Horse. These creatures masqueraded as regular horses until an unsuspecting victim hopped on their back. Then the victim found they could not escape as the Water horse headed into the lake to drown and devour their prey.